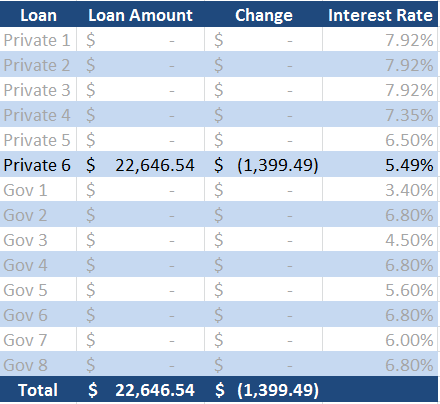 It’s that time for my favorite post of the month; the student loan progress update. The reason for this being my favorite post is that so far I’ve been able reduce my debt every single month. It’s a confidence booster to be able to keep seeing that number go down with every update. June does have a slightly lower payment than what I’ve been paying so far, and that continues the trend from May. I’ve been super busy lately, so I haven’t been able to get a full update on the used car purchase. What I’ve been working out is a separate tracking sheet to show my Roth IRA, emergency fund, and my car loan. It’ll show you where the extra money is going each month as I try to hit each of those three goals. That’s where the balancing act comes in with reducing my monthly student loan payments, though I may change that depending on interest rates. I managed to sneak under $23,000 this month, and you can see I was 51 cents short of dropping it an even $1400. I should have calculated my payment better to get that exact amount! The actual amount I put towards my loans in June was $1500, with the rest unfortunately going towards the interest that had accrued. I’m still working on reducing that interest rate once again, so we’ll see how that goes. At the current interest rate of 5.49% I should be putting all my money towards the loans, but there’s also the fact of peace of mind. You can only invest in a Roth IRA $5,500 each year and the after year is up, you can’t really make up those contributions. The government does allow “catch up” contributions, but that is at an age much closer to retirement. I’m hoping that the compound interest I make from investing at a young age will more than make up for the slowed down loan cost. After that I’ll have to decide how quickly to fully re-fund my emergency fund. It’s all about the opportunity cost and hoping you make the right decision. Things would be much simpler if we could just predict the future! If you remember that early in the year I was planning on moving out, so I set a much lower goal originally that estimated my payments decreasing around this time. When those plans changed after thinking it over and talking with my girlfriend, I created a more lofty goal based on $2400 a month or more payments. It looks like now I might end up somewhere in between there depending on how I continue to approach my payments. I’m currently on pace to hit the $15,000 goal next month, so I’d complete that original goal in 7 months. I made $2400 monthly payments longer than I predicted with that goal, and I only brought my loan payments down to $1500. I had assumed payments of around $1000 if I was paying full rent. I’m also ahead of pace to hit my $24,000 goal as well, but that pace has been slowing down from the beginning of the year. I’ll see what I can do to still reach that goal, but continuing at $1500 a month may place me just short of that goal. Congrats! I remember when we were paying off my husband’s student loans and some medical debt. Each time I made a payment, I’d announce what the new totals were to keep us going. Thanks 🙂 I think keeping track of your total each payment is a good way to stay motivated. It’s the main reason I even started blogging. Love when the number breaks that barrier, like your 23K becoming 22,656, makes you push a little harder to get there. Yep, every little milestone helps to stay motivated. Next one is getting it down to the “teens” I’d say! Nice job! Every dollar you pay is one step closer to Financial Independence! Thanks! That’s a good way to look at things. Congratulations! It’s so great to see how much progress you’ve made — nearly $60K down. It’s been a long and expensive journey, hoping that it ends sooner rather than later.